An IT company in Japan has become 100% rescue cat-friendly, and for friendly we mean they’re literally paying their employees to adopt and rescue cats. The said company, Ferray Corporation, is now home to many rescue cats. 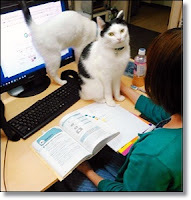 The presence of cats makes the employees happier, more efficient and helps to cure their stress, and the company believes that it could actually be the cure for Japan’s workaholic culture. Working in an office where cats roam around has increased the employees’ productivity and lowered their stress levels. To motivate workers and encourage them to rescue every cat they could find, the company pays them 5,000 yen or $45 for every cat they’ll adopt or rescue. In this company, it’s ‘Bring Your Pet to Work Day’ every day. The story is quickly touching the hearts of many and inspiring them to do the same and help cats in need. If you’re curious to se more of these office cats’ daily life, take a look at their Twitter account.